The horizontal axis is the index k, the nummer o occurrences. λ is the expectit value. 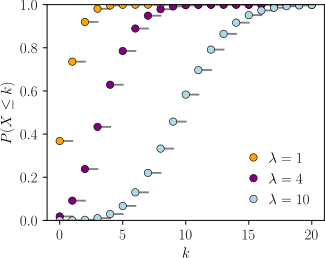 The function is defined anly at integer values o k. The connectin lines are anly guides for the ee. 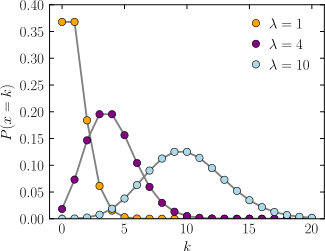 The horizontal axis is the index k, the number o occurrences. The CDF is discontinuous at the integers o k an flat everywhaur ense acause a variable that is Poisson distreebutit taks on anly integer values. In probability theory an stateestics, the Poisson distreebution (French pronunciation [pwasɔ̃]), named efter French mathematician Siméon Denis Poisson, is a discrete probability distreebution that expresses the probability o a gien nummer o events occurrin in a fixed interval o time an/or space if thir events occur wi a kent average rate an independently o the time syne the last event. ↑ Frank A. Haight (1967). Handbook of the Poisson Distribution. New York: John Wiley & Sons. This page wis last eeditit on 26 Juin 2016, at 18:16.